Everything can be carried, and so we believe that containers should be made to be able to carry anything that comes their way. That’s why whether you’re looking for a new cookie jar or needing a couple containers to help separate some used wall grout, the options listed below should be more than adequate for your needs. Small but powerful, mini rounds are the plastic pails recommended for using when transporting food and dairy products. Although, their small size also makes them apt for storing grout and wall joint, or anything that you’ll be using in motion. A step up in size from the mini rounds, these containers are best used for food and dairy products, pet food, bird seed, paint, and a variety of other industrial products. While still fairly little, these containers can carry up to 9.5 litres of anything you need. These guys are great when it comes to storing vegetable oils, detergents and inks, and as usual are solid containers for food and dairy products, since they seal very well. 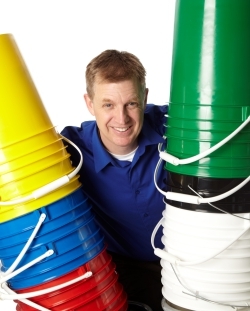 Made of tougher stuff than medium rounds, large round buckets have a maximum carrying capacity of 30 litres and are best used when in need of carrying paint, adhesives, chemicals, cleaning products, and food products. Unlike the previous containers, squares come in all sizes, from 1.1 litre plastic pails to 20 litre mammoths. Considering the variety of sealing options on a square container, it makes them suitable for containing food products, detergents, and pet food especially. Being able to hold between 19 and 23 litres, these containers, which are available in both round and rectangular, are most commonly used to safely handle chemicals, cleaning products, concentrates, and acids. The optional knock out in the screw cap allows for the installation of a faucet application, meaning that you don’t even have to come in contact with the hazardous materials inside when pouring. With a maximum carrying capacity of 6 US gallons, UN packaging open-heads are great for handling chemicals, cleaning products, liquid fertilizers and dangerous goods. The variety of caps also allows you to customize the product for whatever you need it to contain. More for use in the house, these plastic pails are great for storing pet foods, bird seeds, grains, de-icers, candies, and cookie dough. But if you’re looking for a little bulk, you can always order the larger sizes, which hold up to a maximum of 13 US gallons. As the name indicates, these containers are best used specifically with dairy products. If you’ve got any ice cream or sour cream, this is the bucket for you. These are also perfect for mixing. These containers can be used for containing anything fish products or dirty laundry, and they come with carrying capacities from 10 pounds to 60 pounds. Mind you these are just recommendations, so if you know exactly what you need to carry then by all means stock up on that set of plastic pails. But if you’re more of a preemptive shopper, why not make a sample package for yourself so you’ll be ready for whatever comes your way. Everyone needs to carry something sometime.